Any other gouache gurus out there have a tough time getting the lighter blues to play nice with white paper? They do fine for me on toned paper, and the darker blues (ultramarine, prussian) do fine on white paper. But the lighter blues (cerulean, cobalt, and turquoise somewhat) just don’t want to smooth out. They tend to look blotchy, and get looking kinda chalky when layered. I’ve tried several brands of each and it’s repeatable across brands. Anyone? I feel fairly good about this one, but I got the effect after much fiddling. I ended up laying it down out of the tube, evenly over the entire blue area. Then I scrubbed most of it off with a paper towel… and repeated the process over and over again. The paper took a beating well, so I got lucky. I guess that’s the way a lot of paintings work, isn’t it? Ahh perfect character match up. 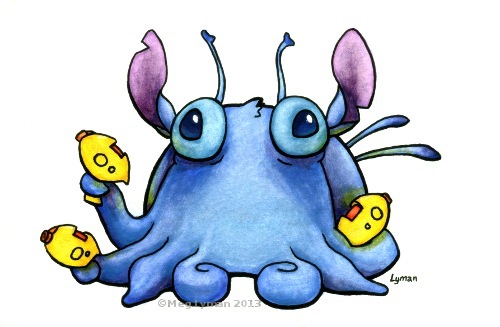 I imagine this as being in one eps where Stitch gets in to a predicament where he somehow transforms in to a squid. There is however that partner in crime that goes and has to capture Stitch. You know what I’m talking about ?The pale colourd alien character with the one eye? He looks like a weird squid. Over all looks great, I don’t see the issue with the light blue. I would think you did try starting with a white base gouache and then adding blue? How about starting with a clear medium and adding blue with that. You could use a bright blue ink. I’ve used this (the kind used in tie dyeing) and mixed it in to my blue gouache to make it pop. Yeah, that one-eyed alien could easily be transformed into a squid.